At YardKit, we help homeowners reimagine their outdoors to enjoy beautiful outdoor living spaces, and solve for tricky landscape challenges like this one. If you’ve been writing off areas with challenging terrain, take another look. Not sure what to do with your property’s topography? We get this question a lot. Whether your house is nestled in rolling hills or perched on a steep slope, unique terrain can become an integral part of your outdoor living spaces. Sure, slopes can present a challenge. You may have difficulty keeping high-maintenance plants happy, and free-moving water can cause troublesome ponding or erosion. Retaining walls are pricey. But these areas aren’t unusable, and they needn’t be a headache. Take it from a team based in San Francisco: your hillsides can become your property’s most unique feature. Make the most of every inch of your property by embracing sloped areas with these artful ideas from YardKit’s professional designers. For the full effect, connect mini outdoor rooms with a fun network of exploratory paths. Our go-to is a 2’ wide gravel path with steppers of local stone or wood in steeper areas. Consider splurging on the steps you’ll see from your back door — they create an inviting view from inside. Sloping land is ideally suited for natural play features. Look for an ‘embankment slide’—like this high-end or this budget-friendly option—that you can install directly into your hill. For an extra challenge, add a climbing wall to reach the top (check out this impressive DIY version or find one off-the-shelf). Perch a playhouse or fort from tree branches and trunks. These invoke the classic “King of the Hill” and “Capture the Flag” neighborhood games. If it’s not too steep, add a swing. And if there’s space, add a zip line to a far corner. Prune under brushy plants to carve out a maze that kids can run through. A favorite playground we’ve seen was a labyrinth under the canopies of manzanita shrubs carved by a school janitor. Kids loved to explore this labyrinth more than their school's play structures! Add a waterslide that flows into an existing pool and become the coolest house in the neighborhood. Rather than battling inclines, embrace them. Add a cascading water feature that can be seen from key windows inside. You'll create an atmospheric quality for outside living spaces while masking sounds of nearby road traffic or rowdy neighbors. 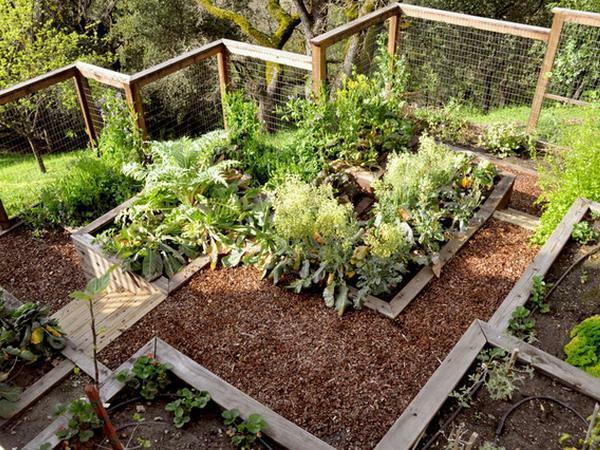 Hillside terraces lend themselves to raised planting beds for easy-to-reach kitchen or cutting gardens. Adding pathways between beds on alternating terraces will make gardens easy to access, and raised planters will also save your back while harvesting fresh fruits and flowers. Or, turn a sunny, dry space into an urban vineyard. Add a rainwater cistern at the top of your hill to collect rainwater if you have the room. You can use this as a gravity-fed irrigation system to water plants below, no matter the season. Cover slopes with locally adapted plants suited to your area. Plant textures and seasonal colors will create a beautiful backdrop to outdoor spaces, while their roots help to stabilize hillsides and prevent erosion and landslides. Lean towards plants that require less maintenance. If you’re facing an especially steep or broad slope, or have a barren hillside after recent construction work, consider broadcasting appropriate seeds mixes from your local nursery. Keep in mind that seeds need time—and water!—to mature before being effective erosion control solutions. It’s best to plant hillsides after the rainy season and keep young plants well supplied with water during warm summer months. Look into natural products like jute netting and fiber rolls to help protect young plants and hold them in place during root growth. Sir Isaac Newton was right about gravity: water flows downhill. Keep his falling apple in mind as you plan new outdoor projects. It may seem obvious, but there are many ways rainfall and irrigation water will wash over surfaces and soak into soils. This can cause big problems, like damage to your home’s foundation or standing water that invites mosquitos and other pests. Be sure to install drainage solutions alongside new amenities. Simple landscape solutions can solve common problems and transform an unruly eyesore into dramatic vistas or fun activity zones. Whether as a walled backdrop to an outdoor firepit or a fun addition to a play space, you'll want to be sure your outdoor spaces connect together with your hillside additions. Professional landscape designers, like those at YardKit, can guide you to the best solution for your unique space and select the proper plants and materials for hillside surfaces. Looking for more outdoor solutions? Head on over to Pinterest for inspiration, or call on a pro YardKit designer to help.